A small number of activists have been staging weekly demonstrations urging MPs to adopt more ambitious climate measures. So far this year, weekly demonstrations demanding faster action to slow climate change have attracted tens of thousands of young people in Belgium, the Netherlands, Germany and other European countries. Most are inspired by 16-year-old Swedish activist Greta Thunberg, who has been skipping school each Friday since August to demonstrate in front of the Swedish Parliament – except when she addressed the UN Climate Conference in Poland in December and the World Economic Forum in Switzerland last month. The movement has since spread to at least 30 countries, mostly in Europe. So far there has been a low-key response in Finland. A few hundred high school students protested on the steps in front of Parliament in January. Other Fridays have brought a few dozen activists with banners and signs, mostly adults. A larger event is planned for 15 March. Stopping by to support this week's demonstration were fourth graders from the Helsinki suburb of Kulosaari, who were on a field trip to Parliament House. Also on hand was someone in a polar bear suit offering hugs to passers-by and inviting them to join in. Demonstrations have been held since late last September in Helsinki, Tampere, Joensuu and smaller towns such as Jokioinen. 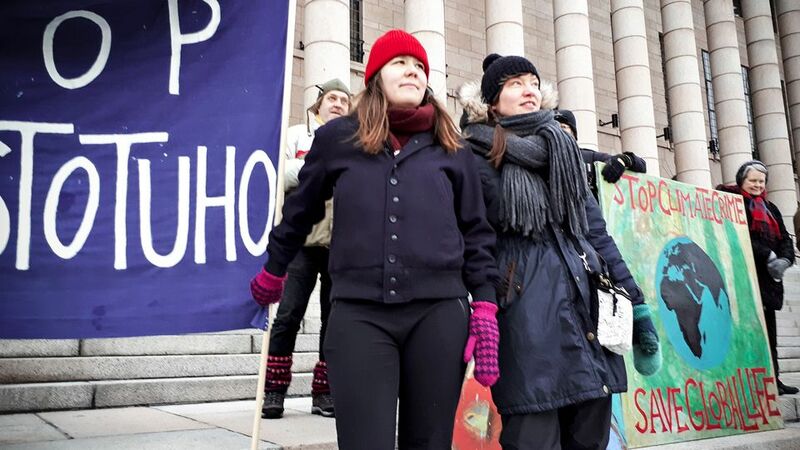 Besides the January student event, the largest demonstration was in late November, attracting over 100 people, according to demonstrators Heta-Elena Heiskanen, a Tampere University researcher and board member at the Finnish Association for Nature Conservation, and Elina Perttola, a theatre instructor. Asked how Finland could become an example of better climate policy for other countries, Perttola replied: "I hope we can achieve a ban on the use of coal throughout Finland. We should widely adopt renewable forms of energy, and Finland could serve as an example in this during its EU presidency term," which begins on 1 July. Heiskanen told Yle that some MPs, particularly from the Left Alliance and Green parties, have stopped by to express support for the demonstrators. 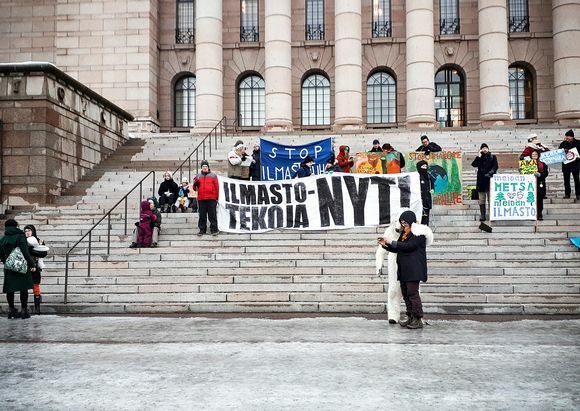 However Climate Parents Finland, an NGO that helps coordinate the weekly gatherings, says that they take place on an informal grassroots basis and are not affiliated with any political party. The association's website lists regular weekly sit-ins in Oulu, Salo, Vaasa and Pietarsaari as well as Helsinki and Tampere. It also calls for people to join in the international Global Climate Strike for Future Friday 15 March. That morning an event called Dance for the Climate is also scheduled for the Parliament steps.